blueshift is a beautiful little pamphlet consisting of a sequence of fifteen pieces of artwork and poetry, each by different writers and artists, and each responding to the one before: a chain reaction of visual and textual imagery which is a delight to experience. The poems and the artworks are all very different, each a free and often tangential response to the previous work, and this is part of what makes the reading of this book such an exciting experience. However, even when the relationships are quite oblique, there is always a linking thread, like a strong but very fine wire, glinting from under the surface of the text. and this could be seen as a metaphor for the pamphlet itself, the way in which each work transforms and transmutes some aspect of the one before. and these images are in turn interpreted in a stunning textile work by Tessa Frampton. Throughout the pamphlet these reinterpretations shift and breathe as the different poets and artists pick up on something from the previous work and take it to a different place. One of the things I found very satisfying was the way in which the colours move through a spectrum as the series progresses. We start with blacks and whites, cold greens , blues; but after ‘Blueshift’, the poem by Pam Job which was chosen for the title of the series, brings in flamenco and mantillas and Lorca, Pete Kennedy’s digital collage ‘Sifting the words of your siguirillas’ incorporates a flash of fire, and suddenly the heat rushes into the collection. Karen Dennison’s ‘Guitar Dreams’ is full of light: a ‘face engulfed / by white flames’, doves’ wingtips ‘singed/ by noon sun’ and lips ‘scorched […] pomegranate red’. it’s not to eat, it’s to look at. Another stunning image, Sheena Drayton’s ‘Persephone’s Mistake’, leads Becky Cherriman into memories of art classes art school where ‘parts of me rotted dark in corners’, and the final image, ‘Frustration’ by Sam Smith, beautifully rounds off the collection by drawing all the colours together in a surreal oil painting of a green pear impaled by red, orange and blue coloured pencils. One of the great pleasures of reading this book is the physical beauty of it. The production values are superb: each image is beautifully reproduced on high quality paper, and each poem is given plenty of space to breathe. It is a pleasure to look at and to handle, which is important, since these poems and artworks make the reader want to keep going back to find more and more resonances and relationships between them. 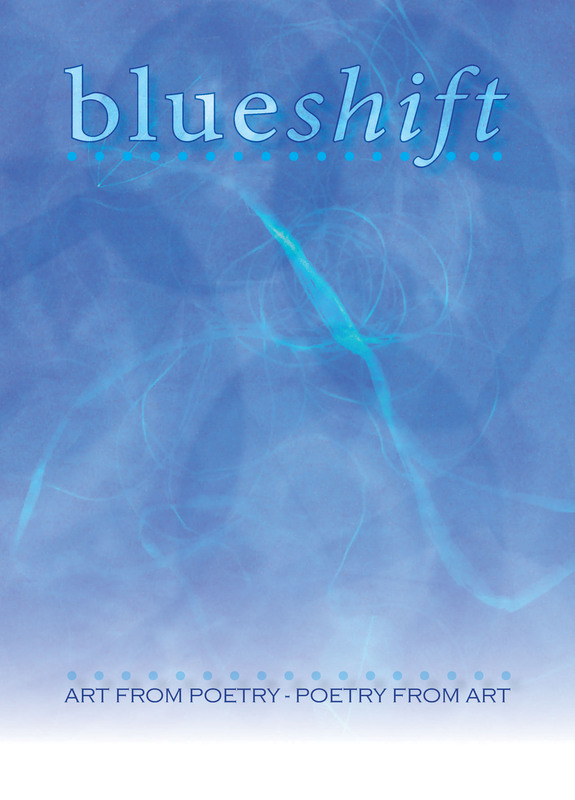 blueshift is the second pamphlet produced by Karen Dennison to have its genesis in an ekphrastic chain of responses. In fact, it is a continuation of the first, since Emmy Verschoor’s ‘Corvus’ is a direct response to the final work in Book of Sand, (2014), E.E. Nobbs’ fabulous poem of the same name. This is a collection to be read and re-read. I do hope the series continues and there are more to come. Sally Douglas is a Devon-based writer with a particular interest in visual art. Her first poetry collection, Candling the Eggs, won the Cinnamon Press 2009 Poetry Award, and her poems have appeared widely in journals. She blogs at sallydouglas.blogspot.co.uk. This chapbook of twenty poems is published by Picaro Press, an imprint of Ginninderra Press. It is notable for its narrow shape, egg-shell-like cover paper and transparent endpaper. The poems are about loss in a number of contexts, including failing relationships, childlessness, hospital admissions and dementia. Each poem brings a distilled image with an intense focus where the abstract and the unseen often become embodied things. For example, in Sense of an ending – ‘The air between us is tired/wants to lie down/dream of doors being open’ and In What the old house thinks ‘my yellow’ is a living thing that once danced and sang and has now been stolen. Paper and folding also feature as metaphors for fragility and acceptance / closure. In Revelation ‘you thin me to paper’; in What the new wife does ‘she folds into routine’ and in Leaving ‘I place my goodbye on the table/ seven years of tears/ line dried, folded in pairs’. This collection really resonated with me and its images stayed with me long after reading, a reflection of their strength and symbolism. I highly recommend it. To end, here’s 17 years in full which I have chosen because of the stunning ‘moths that martyr the windows’. although you left some time before this. until we fold into ourselves. Karen Dennison is a poet and artist. Her website is here. J V Birch is a British poet living in Southern Australia. Her website. When I started off on this Scotney Castle sequence I had no idea that I would be lucky enough to have Karen Dennison’s photographs in the collection. I’d asked her if she fancied collaborating and after she read the poems she said yes. We spent time wandering the grounds – Karen’s eagle eyes settling on the roots of trees that looked like woven rope, or collecting reflections from the lip of the moat. We created a limited edition handmade pamphlet but the card I chose for the cover was too thick to staple so we ended up hand sewing them. They did look beautiful but I was hugely relieved we made so few! A year later the text gave itself to a different story, one that found its voice and momentum in a completely new way. Actually, a way I really didn’t expect. The number of poems grew and found their own footing and Karen supplied more photographs, and we have a wonderful full cover colour – Karen’s stunning photo and Ronnie’s eye for design is brilliant. So here it is in all its glory…. the bitterness of nettles hung around its banks each spring. ramparts, gatehouse, defences, keep. All of this is lost on me. lights each one like a sonographer doing a scan. rain could fall this lightly, this slowly. If you’d like a signed copy let me know via thepoetryshed@hotmail.com, otherwise the lovely Dawn and Ronnie at Indigo Dreams will send it to you (cheaper and more quickly than Amazon!). Support small presses please… because they’re worth it. There’s more from Ronnie and Dawn at Indigo Dreams Publishing in the next posting. tiny tokens from Mother Nature. Cracker prizes for getting this far. proclaim that they shall not be moved. by the stink of compassionate rotting and living decay. harder-wearing, more beautiful, more abundant. I can just smell the same rich rot in my own soil. Here too is space for repair; for mending. and we will both have new clothes next year. It’s a Sunday afternoon, 18th June 1815. Lunchtime. when it started, watches then were set by the sun. of tens of thousands, delayed by weather, thick mud. felt his chest before the sword? A hedge of bayonets. and yet he died, one of many. Others injured, or missing. days in exile – this tree now over one hundred feet high. where the English beat the French, with a little help. Henry. Futile fields. Was it for this the clay grew tall? cedar, grown so tall, in spite of further war the world over. Here now, give thanks for Henry and all who’ve gone before. so they’re rigid as planks. with the weight of clouds. and in the distance green shifts to blue. and rhododendrons choir open throated song. shut their lids to the view. of tangerine clouds rimmed with lime. commands me – Be here now! the Yes, I have one, and the I’ll put it in my bag. now it’s winter and snowing outside. a word, a sentence, a message. but couldn’t quite hear what you said. to unfold from the dead. and a plastic baby doll with one eye open. at its splintered door, peering inside. Karen’s poems have been published in South, Orbis, The New Writer, Ink Sweat and Tears, South Bank Poetry, Artemis (poem commended in Second Light poetry competition 2013 and judged by Moniza Alvi), What the Dickens? Magazine, The Interpreter’s House and in four anthologies: poetrywivenhoe 2011, Heart Shoots, From the City to the Saltings and so too have the doves gone. Karen won the Indigo Dreams Collection Competition in 2011 and her first collection Counting Rain was published in February 2012. Karen is editor and publisher of the pamphlet Book of Sand. as if the originally diluted substance were still present. As part of the residency I am collaborating with poet and artist, Karen Dennison who is working on photographs based on my poems. We’ll be exhibiting both in the ruins this summer. Oh yes and then there’s the pamphlet which I am currently working on and today I’m thinking about readings by the moat on hot summer evenings (yes, they will come), a glass of wine, the gentle breeze in the trees … A residency can be what you make it. An alternating sequence of poetry and visual art, where poems inspire art and art inspires poetry. 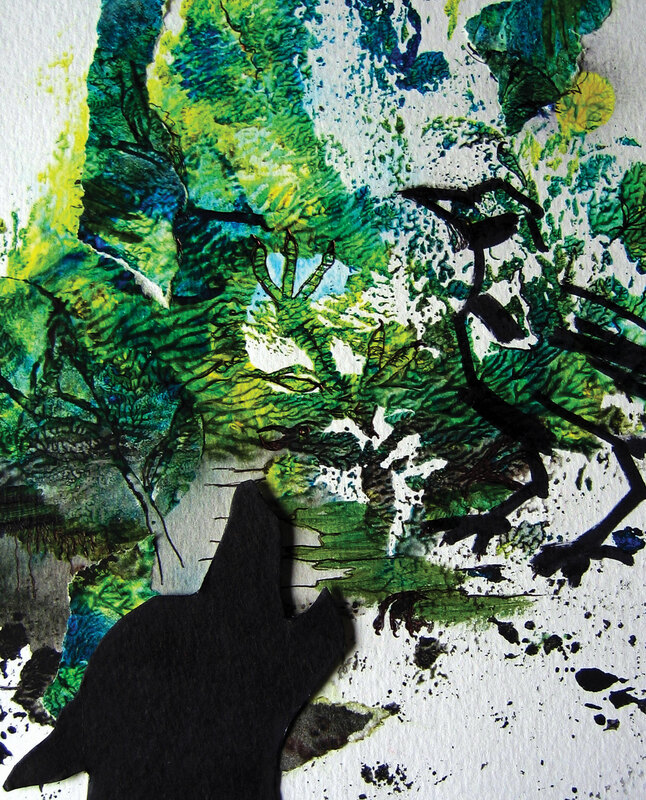 This pamphlet showcases the work of six poets and five artists and is designed, edited and published by Karen Dennison. Poems by Emer Gillespie, Anna Kisby, Sharon Black, Valerie Morton, Abegail Morley and E.E. Nobbs. Artwork by Chris Ruston, Michaela Ridgway, Gwen Simpson, Sam Smith and Karen Dennison. The pamphlet takes its name from, and begins with a poem written in response to, the short story The Book of Sand by Jorge Luis Borges. The poem was given to an artist to respond to with any form of visual art and that artwork was in turn given to a poet to respond to and so on, resulting in a sequential chain of responses. The chain is ongoing and so there will be at least one more edition – to find out more about being involved please contact Karen. to reveal a sudden herd of longings? until they darken with moisture. a wolf rising, rising towards the leaves. Gwen Simpson – Through the Mist; Hand-cut coloured 70lb Canford card; 15cm x 10.7cm. Photographs of this book are in the Book of Sand along with illustrations and paintings from the other artists. its limbs. She moves unseen. from all she knows, freezes over. and together, like flocks of white birds. that flutters around the blind spot of vision. sodden flowers encrusted in snow. a father and daughter whistle an Adagio of snow. slips down the pane, slurs the street lamps’ halos. Published in poetrywivenhoe 2011 and Counting Rain. Karen’s first collection Counting Rain was published by Indigo Dreams in February 2012. Her poem Wayfaring was recently commended in the Second Light Poetry Competition 2013. ……. – a slowing pace. …….and licks it final click into place. …….like midges dancing a soporific reel. Tina Cole’s publications include: Aesthetica Review- Issue 9, Ragged Raven Poetry, Losing the Edge: Blinking Eye – Blood Line. Magazine publications in Mslexia, Aesthetica, Red Ink, Decanto and David Morley’s Poetry Workshop as published in The Guardian. She belongs to a small group of writers called The Border Poets and is involved in a number of local readings and poetry festivals. Rebecca Gethin lives on Dartmoor. She is a creative writing tutor, a gardener and runs a market stall. Her poems have been published over the years in a variety of magazines and just recently in anthologies: Exeter Poetry Stanza’s Making History, Moor Poets vol 3, Lines under Water, The Broadsheet. Her poetry collections are: River is the Plural of Rain (Oversteps Books, 2009); A Handful of Water (Cinnamon Press, 2013). Her second novel, What the horses heard, is to be published by Cinnamon in the spring of 2014. Click here for her website.